Check dayhire availability and prices for MOONLIGHTING using the “Availability & Booking” box on the right hand side of this page. Type? Select Dayhire in the drop-down box. Number of people? You can have minimum of 2 adults to a maximum of 10 people aboard the dayboat. The price remains the same but please let us know how many people are in your party so we can welcome you aboard. Dogs are welcome and are free on the dayboat but we limit them to a maximum of 4 aboard! Date? The Dayboat is available Saturday Sunday, Tuesday, Wednesday and Thursday. Select your date between March and October, then click the Search button. Scroll through the calendar and select available dates to see the prices. The bookable dates are GREEN (We do not hire the dayboat on Mondays or Fridays). When you have decided on your date, Click Book Now to proceed to the secure SagePay payment screens, where you can complete your details. We will email you booking confirmation. 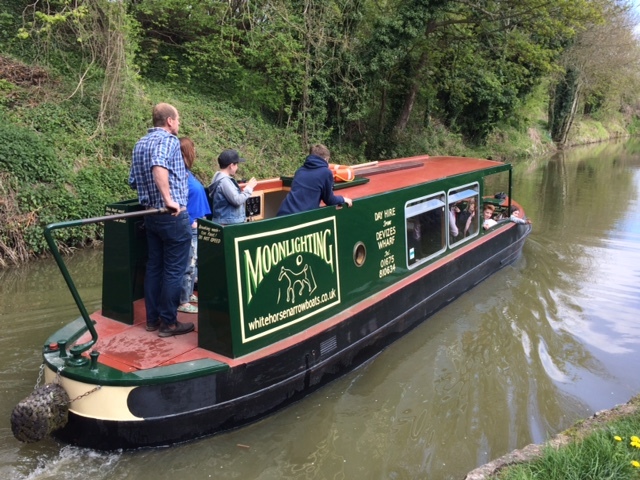 We want everyone to enjoy their time on Moonlighting for all the right reasons, so you will appreciate that following a couple of recent isolated incidents of hirers behaving inappropriately on the canal, we have decided to tighten up on our already existing alcohol policy. We have no wish to be party poopers – a cold glass of beer whilst cruising through the countryside is one of life’s pleasures – but we will now require that any alcohol brought on to the boat will need to be checked in before loading and will be limited to 6 units per adult (this is equivalent to roughly half a bottle of wine or a couple of pints of beer per adult). Hire will be immediately terminated (with no refund of monies or deposit) should the boat be seen to be speeding or disregarding other vessels, or should there be any complaints of inappropriate behaviour or foul language. Thank you for your support in this matter and have a lovely day!